Snow camping in Tasmania's Western Arthurs in winter – extreme! Photo: David Blundy. Snow camping in Australia can be a wonderful experience. Waking up to pink light warming snow-covered slopes, endless vistas of blue hills dwindling into the distance, and that feeling of skiing or snowshoeing across the roof of the world. So, what do you need to know about snow camping in Australia? Apart from the usual things to consider for winter hiking, here are some tips for snow camping specifically. What kind of tent is ideal for snow camping? 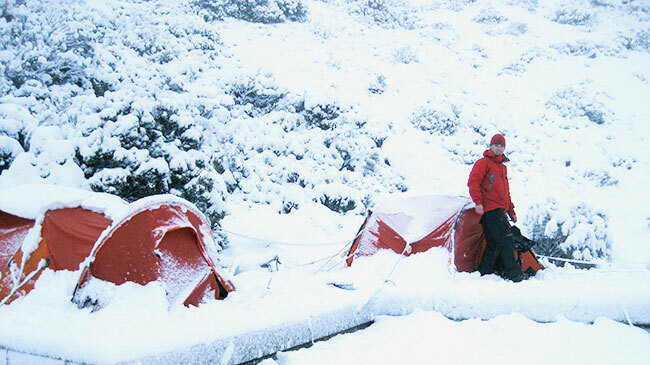 At Bogong, we stock a tent designed for Australian winters – the Mont Epoch. What makes the Epoch ideal for snow camping is that it has a strong pole structure, which enables it to cope with the weight of snow that might fall and collect on top of your tent. The Epoch is also spacious. That's important, because you'll be spending a lot more time inside your tent than you would on a summer trip. That's simply because winter is colder, it's darker for longer and you might get caught in a blizzard. Finally, the Epoch has lots of guy ropes (7 guy cords, including 4 three-point attachment guy cords). This gives you the means to tie the tent down well. However, the Epoch is a specialist mountain geodesic tent. And, that's not what most people would buy if for snow camping every now and then. 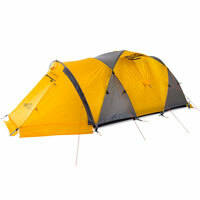 In summary, the Epoch is an ideal tent for camping out in the open in the Main Range. But, for camping next to a hut on Mt Feathertop, for instance, any of the options we listed above would be fine. Ideally, pitch your tent out of the wind. For instance, in the lee of a hill, or in amongst some snow gums or scrub. Create a flat platform for your tent by stamping down the snow where you're going to pitch your tent. This is harder than it sounds, but it's worth the effort, because you'll be rewarded with a better night's sleep. Remove any rocks or pointy sticks. Be aware of your surrounds. Don't pitch your tent in an avalanche runnel, or some place that's likely to be impacted by rockfall or ice. Consider which way the wind is likely to come from. Pitch the tail of your tent into the wind. The main thing is, you don't want wind blowing into your tent door. A handy alternative to tent pegs are snow pegs. These differ from normal tent pegs in that they have a much larger cross-sectional area. In other words, they're big and wide, which means they don't just pull through snow. The Mont Epoch can take 15 pegs, but these don't all need to be snow pegs. Four or six snow pegs will do. Another trick for securing your tent in snow is winding a guy rope around the middle of a stick, and burying the whole stick lengthways into the snow. You can also use your skis to secure guys. A snow shovel can be useful. For instance, if you can't find a spot that's protected from wind, you can use your shovel to build a wall using blocks of snow. A snow shovel is also handy for digging seats in the snow where you plan to sit for the evening. This way, you can sit comfortably, with your legs down a hole. Australian snow is often of the damp, wet, gluggy variety. Unfortunately, this means it's heavy and tends to stick to tents much more than light, fluffy powder. If it's snowing heavily, even with the best tent, you may need to wake during the night and clear the snow build-up from the tent. If conditions are like this at bedtime, set an alarm if you're a heavy sleeper. When it's -2 degrees Celsius, you might lose some dexterity. Therefore, it's a simple meal is a good idea. People have different opinions on the best stove for snow camping. However, other people say that in Australia, it doesn't get that cold (on a global scale). Therefore a multi-fuel stove like the MSR Whisperlite isn't necessary. Instead, something like an MSR Reactor or Jetboil are lighter options that are easier to use. (They just don't burn as fast.) Just be aware that if you like a morning brew, you may need to cuddle your stove for a while before you start it up – not the most appealing prospect. Obviously, for an extended trip, a fuel stove would be more efficient. 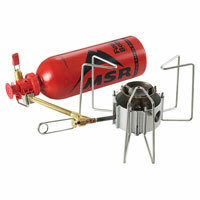 For maximum efficiency, you could go for the MSR Dragonfly – which offers easy flame adjustment. Take extra fuel, because you'll need more fuel to create heat when it's cold and windy. Also, you may need to melt snow for water (because creeks and other water sources might be buried under snow), in which case you'll need even more fuel. Typically, tent manufacturers advise against cooking in your vestibule. That's because of the risk of carbon monoxide. It's a gas that can kill you – and, it's odourless, colourless and tasteless; so you won't be able to detect it. However, the practical reality is that if the weather is bad, most people cook in the vestibule. NEVER cook actually inside the tent inner! When using a stove in the vestibule, ensure there is adequate ventilation. Choose the most protected vestibule opening and open it as wide as possible to let air circulate around the stove. Place the stove such that it has as much vertical clearance above it as possible, because stoves can flare, and you want the tent fabric to be well away from any flames. Ideally place the stove just out in the weather, but where you can reach it easily from under your protected canopy. Your tent is made of highly flammable synthetic materials, which, nothing else, will melt if exposed to extremely hot items. So, bear that in mind if you've got a fuel stove or hot pans nearby. As with any toileting scenario in the bush, be mindful of where you're going. It's especially important, because you might find that you can dig through 30cm of snow, but the ground beneath is frozen, stopping you from digging a proper hole in the actual ground. If you simply relieve yourself in a snow-deep hole, when the snow melts, your excrement will likely not have broken down. That's why the most environmentally sound way to go about your business is to use a poo tube. Generally speaking, though, in Australia the ground is seldom too frozen to dig. Covering the floor of your tent with a big piece of closed-cell foam makes your whole tent floor warmer. Alternatively, you could use a Grabber All Weather Blanket. Taking two sleeping mats gives you better insulation from the cold ground. An Exped down mat is a worthwhile luxury for maximum warmth when you're sleeping. It'll eliminate the need for two sleeping mats. 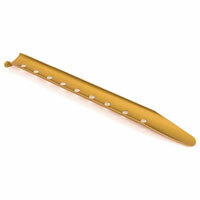 For sitting down outside, a small piece of foam or a Grivel Bubble Mat keeps your bum warm and less wet. 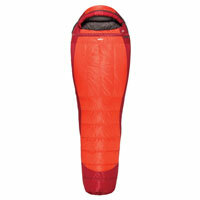 Ideally, we recommend using a sleeping bag that's about five degrees warmer than you need. Also, a sleeping bag with some sort of water treatment is a plus (e.g. Mont Spindrift). Alternatively, you could bring two sleeping bags. For instance, if you have a three-season bag (e.g. Mont Nadgee) and summer bag (e.g. Exped Ultralite 500, or an actual extender sleeping bag like the Mont Hotwire), you could bring both of them and use the thinner summer bag as a liner. Obviously, this set-up isn't as light as simply bringing one warm bag, but it's a good option if you can't justify getting a sleeping bag specifically for snow camping. Stand your skis (and ski poles) upright in snow. Doing this ensures you'll find your skis even if a foot of snow falls overnight. If you leave your skis flat on the ground, they could easily get buried and lost. For the same reason, don't leave any gear lying around outside overnight, because it might disappear in new snow.